April 26, 2015. 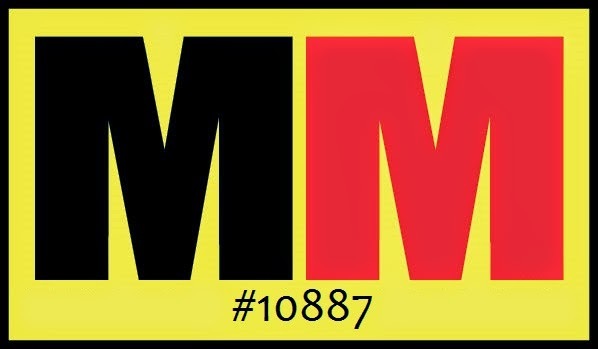 Most of the US knew this date as the day of Big Sur International Marathon. Someday. Someday I will run Big Sur. 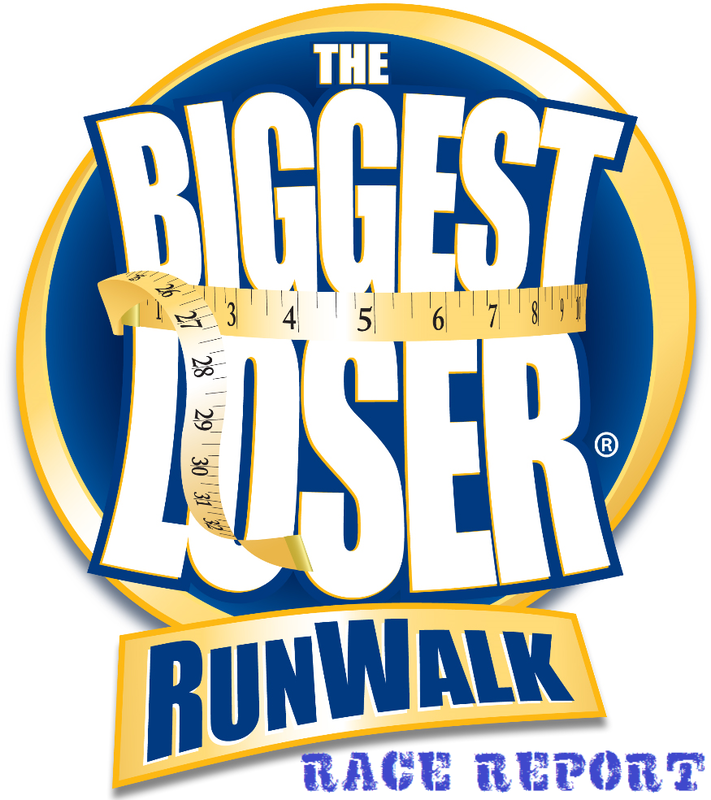 But, for today, I was on my home ground running the Biggest Loser Half Marathon as part of their run/walk race series. 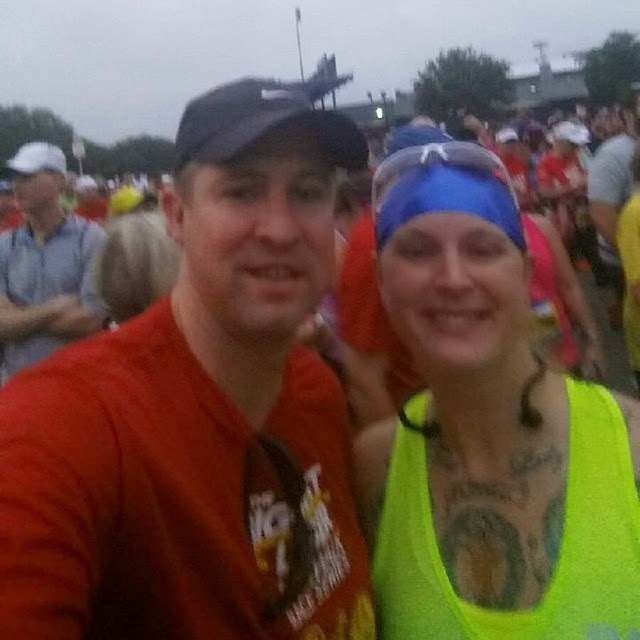 This year they put the race in Round Rock, TX starting and ending at the Dell Diamond (home of the Round Rock Express baseball team) and around various trails and roads of Settler’s Park. I’ve never actually ran in this area before, but I think I might make an effort to make the short drive from my apartment just to run here in the future. The day before the race was the expo. If you can really call it an expo. There was literally just a handful of vendors. 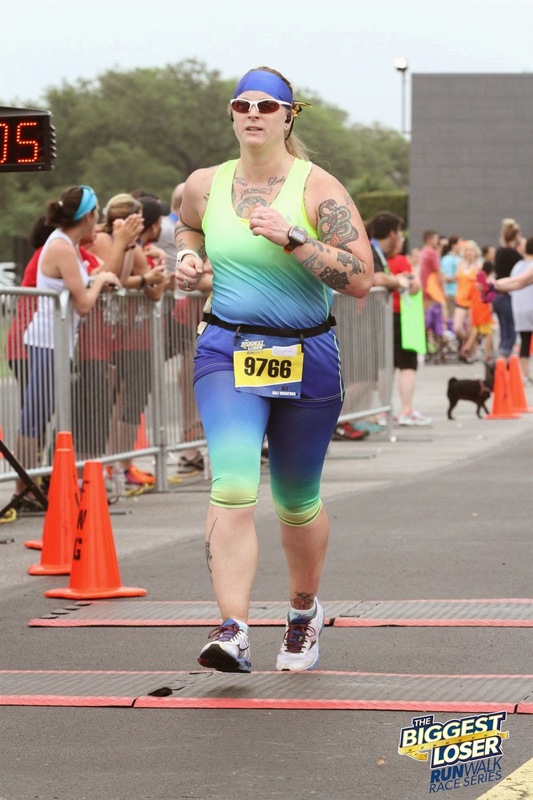 There was a vendor selling post-race kooshie flip flops, a vendor selling knobby foam rollers, BondiBand (my personal fav), a vendor selling official race merch (so not actually a vendor), and Go Girl was there (ugh…I’m so annoyed by this product), and one more vendor, I believe. 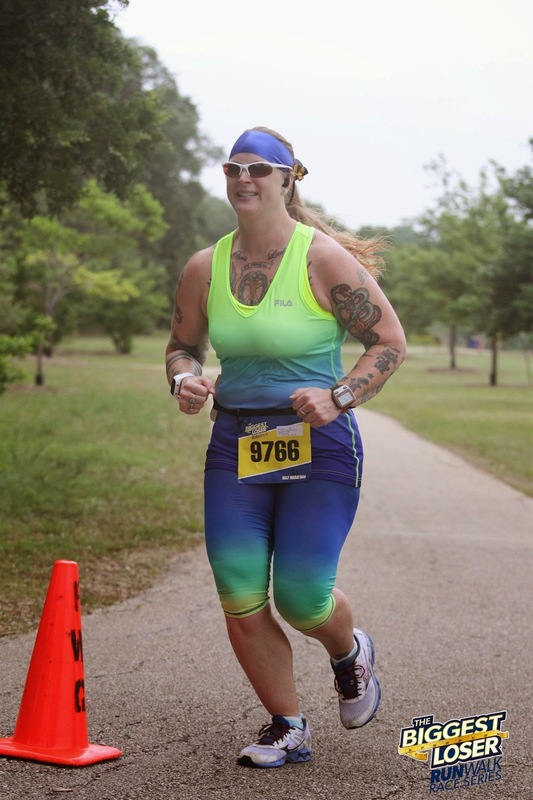 I only hit up BondiBand for 3 more headbands, one of which I did wear to run the race in because it matched my outfit I had picked out. I had planned to hang out at the expo, hoping it was bigger than last year, but it wasn’t, so I didn’t. I would have liked to have heard some of the speakers, but oh well. Maybe in the future they’ll draw more vendors and have an “actual” expo. I mean, this is only their second year in the Austin, TX area. Fingers crossed. Shortly after I left the expo after picking up my packet, I was having coffee and a donut at Dunkin Donuts and was perusing my Instagram feed. 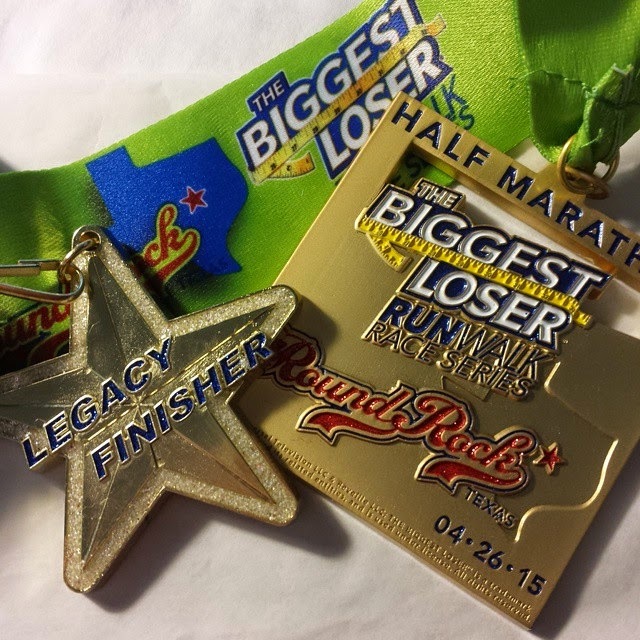 I noticed my friend Rob had posted a screenshot of an email he had received the day before from Biggest Loser race series urging him to register and that if he did then he would earn a “legacy finisher” medal since he had also ran last year. Hmm. I ran last year and received no such email. I went to their website and there was absolutely no mention of a “legacy finisher” medal anywhere. So, since I hadn’t gotten too far from the expo site, I drove back and went to inquire about the second medal. Thankfully, the lady I asked at the volunteer tent knew what I was talking about and gave me the info I needed! Thankfully, the anxiety I had been having most of the week (not because of this race…other stuff is going on) did not act up the night before the race and I slept decently. I stopped at the store on the way to the race start because I forgot my Imodium. So, I got that and, since Starbucks has a location inside this particular store, I grabbed an iced coffee, sans ice (it’s already chilled, so don’t really need it) and was on my way. As I sat in traffic waiting for my turn for a green light to turn into the Dell Diamond, I ate my chocolate chip bagel and my banana. I was hungry. 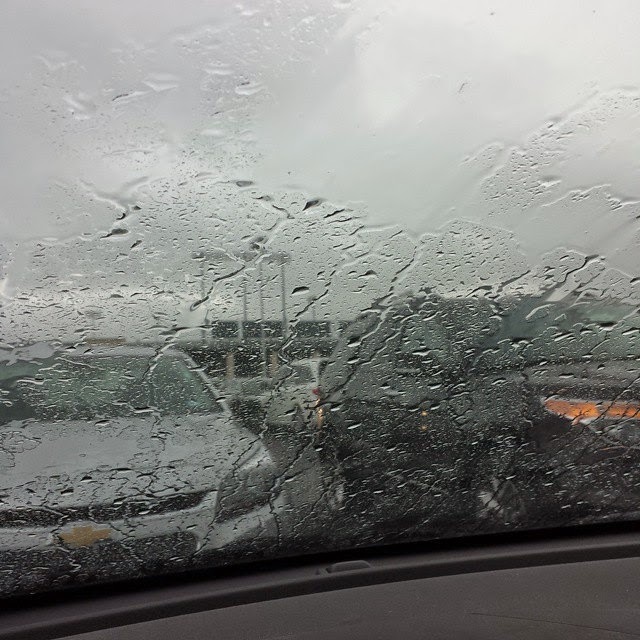 I parked and chilled in the car. I finished my coffee and then started drinking water. About 6:30, I decided I should hit the port-a-potty before race start. The line was ridiculous, but was moving along fairly well. Happened upon Rob while waiting in line too! We did our biz and then met up again at the start where we took our now traditional selfie together. There were pace groups again, just like last year. Last year I ran with the 11:30 pace group. 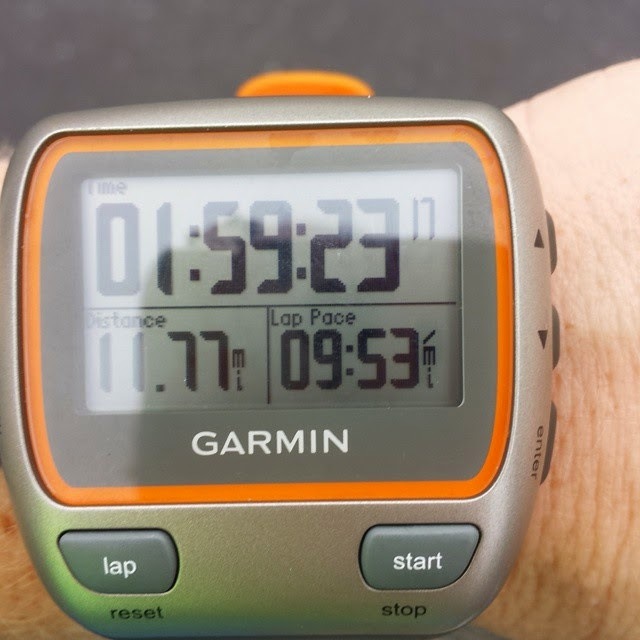 This year, I had a goal to finish in 2:20:00 or faster. That meant I needed to run 10:41 or faster per mile. So, after the air horn sounded for our wave, I eventually made my way up to the rear of the 10:30 group and paced with them for the whole race. 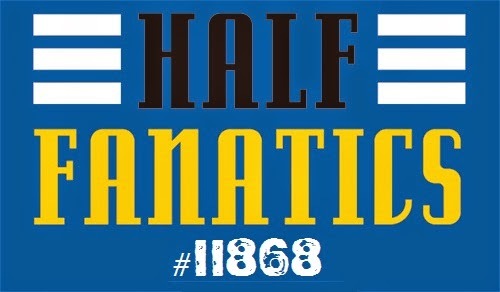 I wish I could run a 1:59 half marathon! Haha! 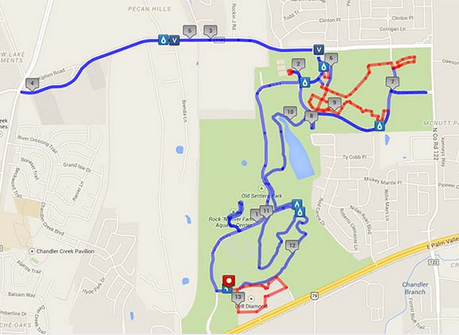 Most of the race was on either asphalt or paved trail. Part of it was on very old asphalt paved trail that was cracked and potted and slightly dangerous. I had to watch my step big time. Then, part of the trail was on actual trail! This was pretty cool! I’ve never actually ran on a trail-trail before, you know? I think I like it. In fact, I think I might do some trail running on purpose this year here and there. It’ll be a great way to switch things up here and there. Anyway, Settler’s Park is very pretty and I really enjoyed running through it. Right about where it said was just past mile 12.5, fat rain drops started falling. Uh-oh. I wore my Bluetooth headset not my ear buds. I didn’t think it was supposed to rain until the PM. But, thankfully, it was just a little bit and stopped after a couple minutes. We finished and collected our medals. I made my way back over to the volunteer tent and collected my “legacy finisher” medal as well. I went back over to the finish area to see if I could see my friend Bill finish as he wasn’t too far behind me, but he either finished while I was getting my second medal or had slowed way the heck down. I stood there for a while and never saw him. But then Rob texted to see if I had finished and if I was still there. He met up with me and I had him take a pic of me with my 2 medals. 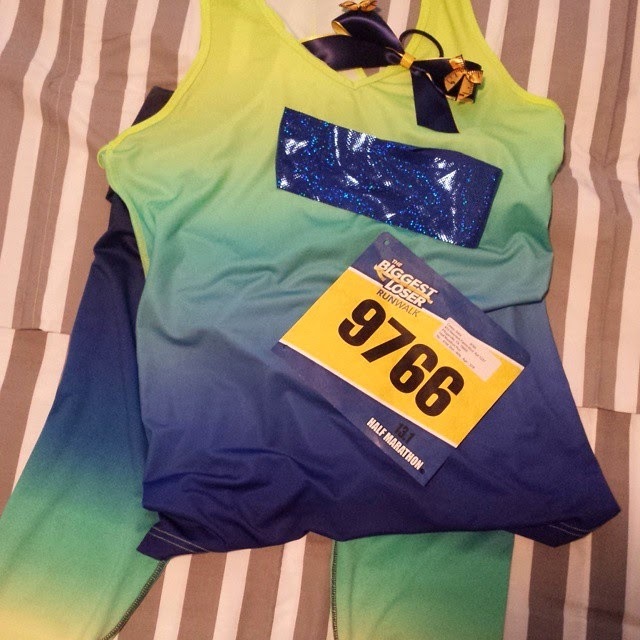 He commented that I always have such colorful outfits for the races I run. I just like to have fun. While I was waiting to get my “legacy” medal, one of the ladies affiliated with the race said that what had happened with the mileage was that the lead cyclists had taken the front runners on a wrong turn. I also heard one of the very few on course volunteers telling another runner that he had been standing near the mile 9 marker and was wondering why no one was running passed it. 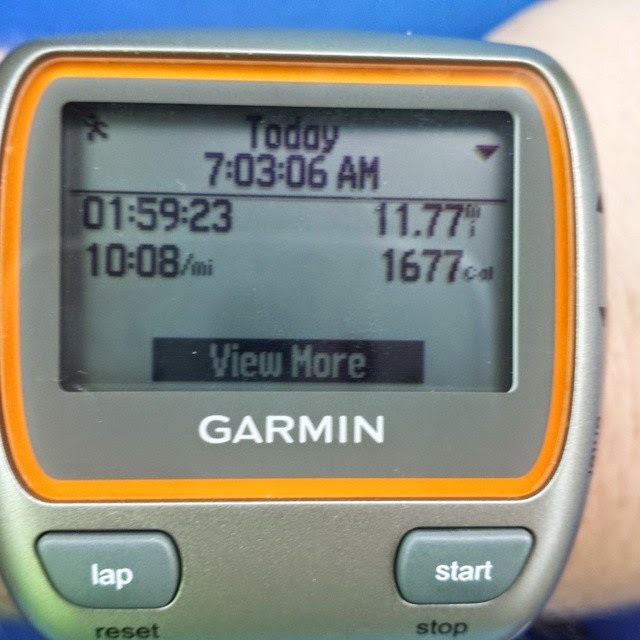 I got home and I compared my Garmin data to the map that Biggest Loser provided on their website and yep, sure enough, we completely missed mile 9. 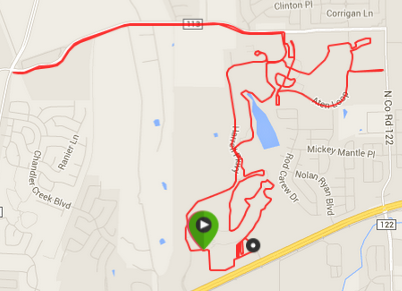 It appears to have been some more off road (what I previously called “trail-trail”…haha) trail plus a double back on a paved trail. All I have to say about this oversight is: better signage and more on course volunteers. Despite the huge disappointment with the mileage, I do love this race and I will do it again next year. I hope they do the “legacy” medals again! I love that so many different people participate in it. 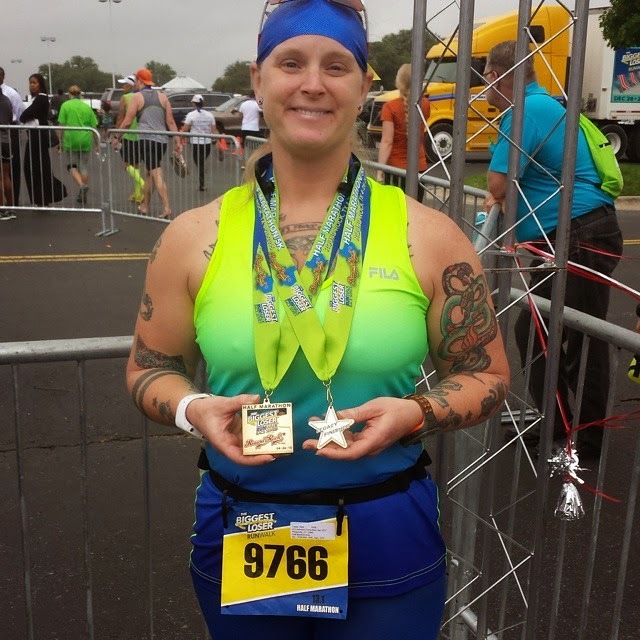 It is such an accepting race and that is just awesome…because sometimes…well, sometimes runners can be SNOBS. Just because someone can’t run 8 minute miles doesn’t mean they don’t deserve to participate. The variety is what makes it great! I, personally, only have a problem with slower runners and walkers/stroller-pushers when they position themselves at the front of the pack when that’s not where they should be at all. I think anybody that wants to run or walk an event should do just that. The more people, the better! About 25 minutes after I finished, there was a huge crack of thunder. Rob and I looked at each other and said “time to go!” On our way to our cars lightning struck 2-3 more times and crashed loudly. I got in my car and like 3 seconds later it started pouring. So much for the rain waiting until the PM. Glad I had finished before the rain started. It would have most likely ruined my Bluetooth headset. In the official results, I finished 14th out of 71 ladies in my age group. Very very nice finish. I know everyone ran/walked the exact same short course, but I’d still feel better about that 14th place if I had run the whole 13.1 mile course. And, of course, one of the great things about this race…FREE OFFICIAL PHOTOS!!!! Big Sur is on my "someday" list too. Your outfit even matches the medal ribbons, too cute! I'd be so angry about the course errors and probably would send an email saying they need maps for the cyclists, signs and volunteers to direct runners, or I'd say I wouldn't do it again. You've got such a good attitude about it. What Advice Would I Give The Younger Me? Why Did I Start Running?